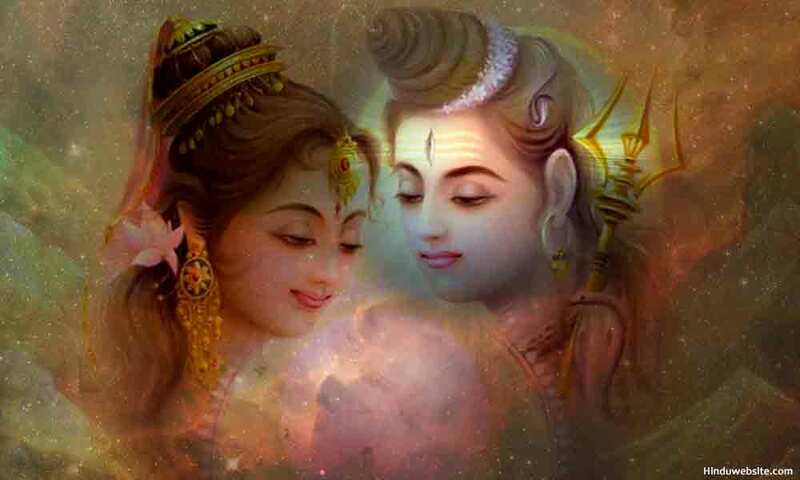 You may worship Shiva and Parvathi or Vishnu and Lakshmi or Brahma and Saraswathi. You may worship any of the numerous gods and goddesses of Hinduism, their aspects, incarnations, emanations and associate gods. On the path of liberation, you may be a Shakta, Tantrika, Bhagavata, Shaiva, Kapalika, Vaishnava or an ascetic worshipping a guru or a personal deity of your choice. However, all these numerous gods and goddesses of Hinduism are but the objectified manifestations or aspects of two eternal and fundamental principles of existence. They exist in you and me. They exist in the entire universe. If one is the goal, the other is the path. If one is God, the other is the worshipper. Both are important for our happiness and wellbeing, peace and prosperity, rebirth and liberation. You have to worship them both, because they are inseparable and cannot be worshipped individually. As the Isa Upanishad makes it abundantly clear, those who pursue only one at the expense of others enter the darkest hells (asurya lokas). It is by worshipping both, and offering our actions to God, one should wish to live upon earth for a hundred years and attain liberation. Who are these two eternal principles? Where do they reside? How can you distinguish them? Can you trace them in your own being? The answer is yes. In Hinduism, we identify them as Purusha and Prakriti. They represent the two highest realities of existence. Both are indestructible and eternal. Both have known and unknown, manifested (vyakta) and unmanifested (avyakta), being (sambhuta) and nonbeing (asambhuta), gross (sthula) and subtle (sukshma), formed (murtha) and formless (amurtha), visible (drsya) and invisible (adrsya) aspects. Hindu tradition equates them with Father God and Mother Goddess. They are the universal deities who are hidden in all gods and goddesses and every aspect of creation. In Hindu mythology, they are symbolized as Ardha Narishwara (half-male and half-female). 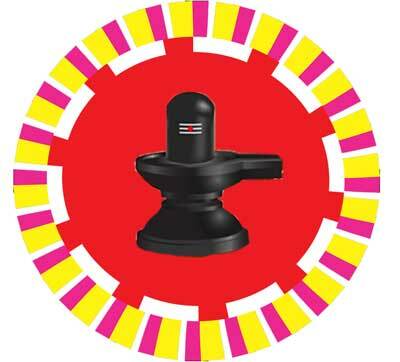 The Hindu tantra, symbolically deifies their union as the Shivalinga, in which the cylindrical part represents Purusha and the circular base, Prakriti. In the mystic diagrams of the same branch of knowledge, they are represented as a triangle with a dot in the middle. 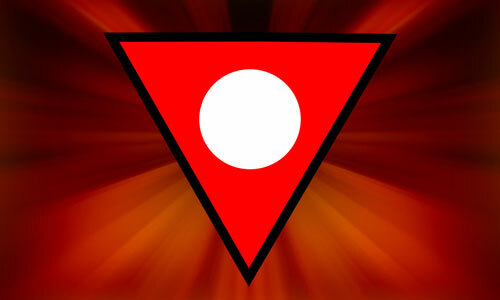 The triangle is Prakriti and the dot is Purusha. For all ritual and spiritual purposes, they are the central deities of Hinduism and represent every god and goddess in the Hindu pantheon. Purusha is the Supreme Cosmic Being, who represents the one, indivisible, infinite, independent cosmic reality. He is the source and support of all. There is nothing beyond him, other than him or above him, except perhaps his own hidden and unknown aspects, about which even gods have no clue. No scripture or divinity can fully fathom his secrets, manifestations and powers. The Vedas describe him as both Brahman and an aspect of Brahman. In the latter aspect, he sacrifices himself to create the worlds and beings. He is without a second, and without a beginning and an end. There is none other than him, here, above and anywhere. In the Vedas he is compared to many organs in the body and many celestial objects in the universe. He is their source and support. As the upholder of the universe and entire creation, he pervades as well as envelops everything that is, that has been and that will ever be. The mind and senses cannot perceive him because he is beyond their grasp. If you think you know him, you do not really know him. If you think you do not know him, maybe you are not looking at yourself. He is both known and unknown. Purusha is the quintessential male, the controlling, regulating, supreme Lord. It is at least the impression you gain from your first reading of any Hindu scripture. However, as you dig deeper, you will realize that Purusha is a just the crowning glory. He is the compassionate one, who only raises his voice or plunges into action when chaos and confusion threaten the very existence of the worlds. You may compare him to a father figure, who is respected by everyone, even feared, but who prefers to remain a passive witness, letting things happen rather than controlling them, while everyone else does his or her duty in his name to make them possible. The real power behind him is Prakriti, the Universal Mother. Symbolically, prakriti represents the materiality and dynamism of the whole creation. She is responsible for all activity, movement, liveliness, awareness and diversity. In her primal state, she is stable and silent, out of which, she manifests chaos, and from chaos order, with Purusha in the background, nodding his approval. Therefore, in the scriptures you will find descriptions of both her fierce and pleasant forms. For the devotees she is Uma or Lalitha, the compassionate, divine Mother, and for the demons she is Kali, Durga, or Chandi, the transformative, violent and fierce goddess who destroys in order to restore, rebuild and reorder her vast empire. Prakriti is an eternal reality who is both dependent and independent. In her primal aspect (mula prakriti), she is independent, but in her manifested aspect she is dependent upon Purusha, because without him she cannot manifest things or unleash her power. In her subtle aspect, she is pure energy (Shakti), and in her gross aspects she is matter (rayi). Prakriti itself means the natural or original state or function. For example, the natural state of water is liquidity, and its function is to flow. The natural state of fire is fiery hot, and its function is to burn. Hence, she is personified and symbolized as Mother Nature. As the mother of all, she represents the universal womb, in which every form and object manifests. Purusha represents pure consciousness, the one, indivisible, indestructible, and ultimate reality (tattva). Prakriti represents the mental states and materiality (chit-shakti), which arise from the 23 realities (tattvas) which are an integral part of her. They are the universal prototypes or building blocks, each subject to three basic modes namely sattva (pure), rajas (mixed) and tamas (impure). Their permutations and combinations result in the diversity of beings and objects. Thus, she is the source (mother) of all the purities, impurities, perfections and imperfections, symmetry and asymmetry, beauty and ugliness, light and darkness, heat and cold, pain and pleasure, good and evil, and other dualities that are present in creation. All the laws, numbers, modes, properties, behaviors, causes, effects, thoughts, perceptions, emotions, consciousness, etc., arise from her only. In their purest and highest aspects, it is difficult to distinguish Purusha from Prakriti, which gives rise to the impression that the ultimate reality is one only, and Brahman is all, without distinction, names and forms. However, they grow apart as they descend into the lower planes of existence, creating the illusion that they are separate and independent. In the gross, material planes, a gulf is formed between them, making it almost impossible for anyone to perceive any similarity or relationship. Hence, in the mortal world no one knows surely whether they are one or two, and whether they are entirely independent or mutually dependent. From our own constitution and from the scriptures we know that they are incomplete without one another, and neither life nor creation is possible unless they both participate in the same field. The Purusha and Prakriti are present in everything from the highest, sunlit heaven to the lowest, sunless hell. In us, Purusha personifies the soul or the Self, while Prakriti represents the mind and body. Together they manifest in the mortal world as Jiva, the living being or the embodied soul. The soul is pure and effulgent. The body in its natural state is impure and dense, bound to birth and death. They impart to the beings the dualities of light and darkness, good and evil, knowledge and ignorance, and purity and impurity. The 24 Tattvas (1 + 23) which manifest in the living beings in the order of their gradual development are stated below. Of them, Manas, Aham and Buddhi are optimally functional in humans. They are partially functional in the higher beings of the animal kingdom such as the mammals, reptiles and some bird and fish species, and are almost absent or inactive in the lower organisms, which are at the bottom of the evolutionary scale. The same is also true with regard to the 15 senses. Depending upon where they stand in the evolution Some beings do not possess any senses as in microorganisms, some possess a few as in plants and fish, and some possess all as in birds, mammals and humans. In humans all the 23 tattvas of Nature are fully functional. In them, the mind, ego and intelligence manifest with their full potential. Hence, human beings are more advanced than the rest of the beings. They possess, self-awareness, individual will, discernment and judgment to engage in the five basic functions of creation, preservation, destruction, concealment and revelation to create their own lives and destinies. At the same time, they are enveloped by numerous impurities, which make it extremely difficult for them to establish any connection with the soul or the pure consciousness in them. Hence, they have to overcome a number of challenges and hindrances to become pure and absorbed in themselves. In the higher planes, where the gods and celestial beings reside, beings do not possess gross bodies, but only subtle bodies with subtle senses, mind, ego and intelligence. Their bodies are made of sattva, with fewer traces of rajas and tams. Hence, they are effulgent. Their souls shine brightly through their translucent subtle bodies, with little or no hindrances. The opposite is true with regard to the beings of the lower worlds. In them rajas and tamas predominate. It makes their bodies gross and dense with impurities, which interfere with their perceptions, knowing and discernment. Endowed with knowledge and intelligence, human beings can develop shining casual bodies and potentially ascend to the world of gods through self-transformation or purification. Through rigorous practice and determination, they may go even higher to the world of Brahman. The very idea of Yoga was born from this intuitive awareness. Yoga is the means to unite Purusha and Prakriti, by bridging the gap between the two through self-purification, which leads to the highest state (yoga) of pure consciousness. Through the practice of Yoga, one reaches the ultimate state of Yoga in which Prakriti enters into her primal state of inactivity and tranquility and becomes absorbed in pure consciousness. From chaos, to order to stability, these are the three successive stages which bring about their reunion. Prakriti is both an obstacle and a facilitator. To the ignorant, she is a problem. To the enlightened, she is a blessing. She is a problem if you do not know how to align your goals and aspirations to her modes, and balance the tattvas through restraint and discipline. Through austerities (tapah) you can also transform her gross energies into subtle energies and use them in your self-purification to attain states of perfections (siddhis). She is the source of energy, enthusiasm, emotions, desires, aspirations, vision, goals, virtues, motivation, will power, mental brilliance, creativity, determination, and so on. She represents your lower nature, beingness or the personality. To the extent you purify it, you will succeed in your spiritual effort to achieve nearness to your own divinity. As the Bhagavadgita emphasizes, the self is the friend of the Self and the self is also the enemy of the Self. Prakriti becomes an enemy of Purusha when one falls into evil ways. The opposite happens when one aligns it to the spiritual aims. The symbolism of Purusha and Prakriti is represented in the following table.